Battle Dress Uniform (BDU) is a broad term describing any of several standard-issue combat uniforms worn by members of the UNSC Marine Corps. Unlike the Marine Corps Dress Uniform, which is worn at parades and functions, the BDU is intended for use in combat situations. Though the Marine Corps fields a great variety of BDU types, all models comprise armor plating over camouflaged combat utilities, as well as a CH252 helmet and combat boots. Ammunition pockets, holsters, and rucksacks are commonly used in conjunction with the BDU. Unlike the MJOLNIR Powered Assault Armor worn by the Spartan supersoldiers, the Marine BDU does not include a recharging energy shield, providing inferior protection against directed energy and projectile weapons. Ushuaia Armory performed a substantial amount of work on at least one version of the BDU. Camouflaged combat utilities are worn under the armor plating. Woodland, desert, and urban camouflage are the most common color patterns for Marine fatigues. Combat boots such as the VZG7 armored boots are worn with the uniform. They are sometimes equipped with different types of additional armor to provide greater protection to the lower leg. The Marine BDU is equipped with one of various models of ballistic armor at multiple points, including the torso, the shoulders, and the shins. Some versions incorporate armor for the forearms, thighs, and groin as well. The armor is resilient against traditional ballistic weaponry though it is easily damaged by plasma weaponry. While different iterations of the BDU feature different armor models, all possess roughly equivalent durability. Lighter body armor, such as the ballistic assault vest, is used in lieu of standard-issue gear during some operations. All iterations of the BDU feature one of several versions of the standard-issue CH252 helmet, which is painted to match the corresponding body armor. The helmet may be mounted with various accessories, such as a holographic tactical eyepiece, a helmet recorder, a boom microphone, polarized tactical goggles, a flashlight, or a night vision device. Marines sometimes wear balaclavas with their helmets, both in frigid and temperate climates. In hazardous situations, gas masks such as the S90 gas mask are worn. Marines on field operations in more humid locales sometimes choose to wear Boonie covers. Marine non-commissioned officers are easily recognized by the cover that they wear, which features the UNSC insignia, although they often substitute this soft cover for a more protective helmet. Several versions of the Battle Dress Uniform are in service, one of which is shared with the Army and the Air Force. The issue of any given model depends on environmental conditions, combat type, and the wearer's role. The standard ensemble with ballistic goggles and balaclava. The Insurrection-Era BDU as seen during the early stages of the Battle of Earth. The earliest known iteration of the Marine Corps BDU was in use during the Insurrection and continued to see service well into the Human-Covenant War and the post-war era, with some units fielding this model as late as 2559. Notably, this model was standard issue during the Harvest campaign and saw extensive use during the early stages of the Battle of Earth. The fatigues have a two-tone greenish gray camouflage, whereas the armor is issued in both reflective drab and matte forest green. The cold environment fatigues use the same camouflage pattern with white in place of green; similarly colored armor and a matching helmet are worn with this version. The shoulder pauldrons for this model come in at least two designs: the standard version has a broad, concave form that covers the shoulder and most of the upper arm, while an off-hand variant is thicker and sits higher on the arm, extending well beyond the shoulder. Marines issued this variant often wear polarized tactical goggles and balaclavas, even in temperate environments. The chestpiece used with this model is composed of very heavy plating. The forearms, shins, and boots are fully armored. Some users wear tactical thigh rigs or holsters, while some wear armor covering the thighs. Often the left thigh is armored while a holster is attached to the right thigh. A Marine wearing the BDU with an M52B chestpiece. This version of the BDU had entered service by 2531 and was used by Marines during the later stages of the Battle of Earth, as well as on Kholo, Algolis, Sigma Octanus IV, and numerous other planets. This model is based around the M52B body armor, which can be outfitted with various accessories such as utility webbing and ammunition pouches; the armor is supported by a black ballistic vest that extends to the arms. The armor and helmet used in conjunction with this model are almost universally painted olive drab, while the fatigues generally feature a woodland camouflage pattern. This version of the BDU lacks the prominent shin armor used with other models, with only the upper shin being armored. This version also lacks thigh armor, though some Marines wear lightly armored holsters on their thighs. The BDU has black knee and elbow pads, although they are only lightly armored. The uniform also includes armored pauldrons. The V7G7 boots worn with the system are covered in light armor plating. Marines often wear fingerless gloves with this model. The armor used in training officer cadets at the Corbulo Academy of Military Science in 2526 appeared to be a smaller, lighter version of the standard M52B armor and bore the Academy's emblem on the chest plate. It shared the shoulder pauldrons of the full-sized model. A Marine wearing the cross-branch BDU. This version's armor protects the front and back of the torso as well as the groin. The vest incorporates separate upper-arm components with clips which allow the attachment of various types of pauldrons. Marines equipped for combat in a normal atmosphere are typically equipped with a GUNGNIR pauldron on the left shoulder and a larger universal pauldron on the right one; the pauldron displays the UNSC logo and lettering and sometimes displays a diagonally crossed hexagon, which is also present on the Army BDU. Meanwhile, space-ready Marines use a configuration of a single universal pauldron on the left shoulder and a smaller UA/Base Security shoulder armor on the right shoulder, which displays the Marine's blood type under UNSC lettering. For leg protection wearers often utilize the UA/NxRA utility armor, which cover both thighs. Wearers often use heavily armored knee guards distinct from those worn by the Army. Some Marines wear heavier shin armor along with GUNGNIR knee guards. Marines who wear the pressurized Atmospheric/Exoatmospheric (A/X) version of this BDU, such as to mitigate the atmospheric hazards caused by nearby glassing, wear an enclosed ECH252 helmet derived from the Beta-5 Division MP helmet, as well additional collar armor similar to that worn by Air Force pilots. A new version of the BDU entered widespread use after the end of the Covenant War, seemingly based on similar model which saw service as early as 2526 with the cadets and Marine garrison of the Corbulo Academy of Military Science. This model shared many features with the postwar BDU, namely a similar ballistic vest, and two-color motif in the trousers, with the insides being either black or khaki brown. While the general arrangement of the postwar BDU's armor sections remains largely similar to the prior variations, a new, more prominent ballistic vest has been adopted as an additional defensive measure beneath the plating. Elements of previous BDUs are also incorporated, including what appear to be several updated models of the CH252 helmet, as well as a new variation of the VZG7 armored boots. As with the other generations of the BDU, there are several configurations of armor worn over the BDU, which consist of several configurations for infantry, officers, and Corpsmen. A variation worn by almost all Marines on-duty aboard the Infinity - possibly a designated security or shipboard configuration - includes a larger, bulkier helmet worn with the basic ballistic vest, armored boots and shoulder pieces. This variant is also seen in either completely red or blue colors in War Games simulations. The standard-issue version worn by Marines engaged in ground operations - designated 'Infantry' - varies slightly, and includes one of two models of helmet - one of which bears similarity to a wartime variant of the CH252 worn with the cross-branch BDU, the other of which is referred to as an 'off-world helmet' - with either an array of tactical pouches or an armor piece on the chest. A variant designated 'Heavy Infantry' has notably up-armored chest plating and a full-face helmet, with a white face-mask and green-tinted visor. This variation shares many traits with the armor worn by NCOs in the field, which combines the up-armored chest plate with an armored collar on the left side of the neck, similar to that worn by postwar Naval officers, and an insignia-bearing cap. Like the cap alone in previous models, it is likely that this variation is often forgone in order to draw less attention. The armor donned by Corpsmen is fully white, with red detailing and a considerable amount of tactical pouches to contain medical supplies. Marine communications specialists wear their comms units on their backs with the standard 'Infantry' BDU. The postwar BDU also has a considerable number of accessories to be worn with it - these include wrist-mounted displays, tactical goggles, thigh and shoulder plates, combat knife sheaths, and helmet attachments. The fatigues worn beneath the ballistic vest and armor are characterized by their twin-tone coloration; in addition to the primary color, the uniform has reddish-brown sections on the inner portion of the legs, the neck, the upper part of the sleeves, and the sides of the torso. The primary color of the uniform is most commonly olive drab, although gray variants are also widely seen, notably on Corpsmen. The armor and helmet itself is either olive drab, khaki, or white, depending on the user's requirements. Combat technicians are known to wear a variant with black fatigues, orange ballistic vest, and a yellow helmet. A variant worn by Marine Hornet and Pelican pilots. Marine pilots usually wear a modified version of the standard Marine uniform, though they are known to utilize the BDU without modifications as well. Several helmet models are used by pilots, including one version with a fully covering flip-down visor, which likely provides a heads-up display; a similar model, seen in use by Pelican pilots during the early stages of the Battle of Mombasa features a larger, gold-polarized visor. Other pilots wear more advanced equipment, including fully sealed helmets and an additional control panel on the standard chest armor piece. Each helmet bears a wing symbol, possibly denoting the wearer's MOS, though this may instead indicate unit affiliation. While many Navy Corpsmen wear the standard BDU with a medical insignia on the shoulder pieces, some use a suit with charcoal fatigues and padding with white armor featuring red shoulder straps and caduceus symbols on the shoulder pauldrons for easy identification. 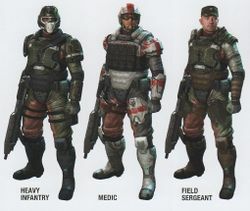 While the standard BDU is most commonly seen in the field, there are multiple specialized combat suits worn by different branches of the UNSC Marine Corps. 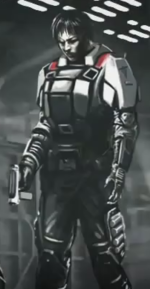 The armor system utilized by the Orbital Drop Shock Troopers is the most notable example, being a sealed full-body combat suit instead of a more conventional armored uniform. During operations in vacuum, Marines wear vacuum suits, often equipped with armor plating. One example of a vacuum-enabled suit is the black body suit, which is a lightweight, form-fitting suit of polymer body armor. Other task-specific suits exists, such as the fire-resistant full-body combat suit worn by the Hellbringers. Heavier armored variants of the standard BDU were worn on counterinsurgency operations by 2524, including a suit with charcoal fatigues and matte-black heavy impact plating covering most of the body and a helmet that fully encases the head. 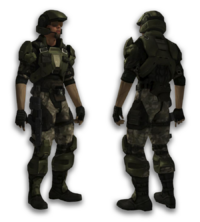 The Battle Dress Uniform as seen in Halo: Combat Evolved was heavily inspired by the armor worn by the Colonial Marines in the film Aliens, which greatly influenced the game. The BDU seen in Halo Wars 2 artwork is an original design, while the one seen in cutscenes and the Know Your Enemy trailer is reused from Halo 2 Anniversary. 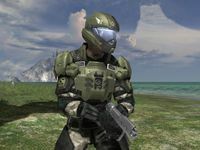 A Marine standing at arms in Halo: Combat Evolved. A Marine wearing a BDU with an M52B chestpiece. A Marine radio operator wearing the same BDU version. A squad of Marines wearing M52B and CH252 variants on Installation 00. A marine in a cold environment variant being hit by a needler round in the Halo Wars announcement trailer. A squad of marines in the cold environment uniform accompanying Forge and Anders. Marines wearing the A/X variant of the cross-branch BDU. 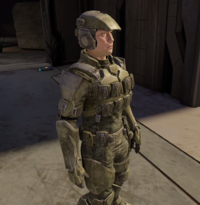 A Bumblebee pilot wearing the M52B armor with a specialized helmet in Halo: Combat Evolved Anniversary. Models of the BDU helmet in Halo 4. 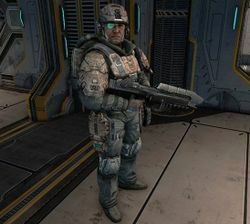 A Marine wearing the version of the post-war BDU mostly used on the UNSC Infinity. BDU variants of other UNSC Marine classes Halo 4. 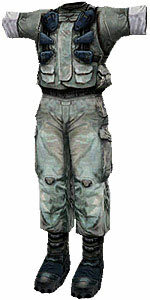 An example of a configuration of the standard 'Infantry' model of the postwar BDU. Concept art of several variations of the post-war BDU - note differences in the final coloring and helmet design. 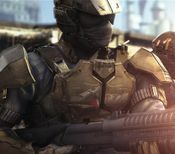 Halo 4-era Marines wearing the post-war BDU. UNSC Marines in Halo: Spartan Strike. BDU in Halo Wars 2 concept art. In-game models of the Marine BDU for Halo Wars 2. Marines with Jerome-092 on Installation 09. 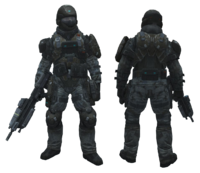 ↑ The article describes this version of the BDU as it is seen in Halo: Reach and Halo: Combat Evolved Anniversary, as it is a visually updated version of the BDU seen in Halo: Combat Evolved.